Each of New York State’s 10 economic development regions has an Innovation Hot Spot designated by Empire State Development’s Division of Science, Technology & Innovation (NYSTAR). 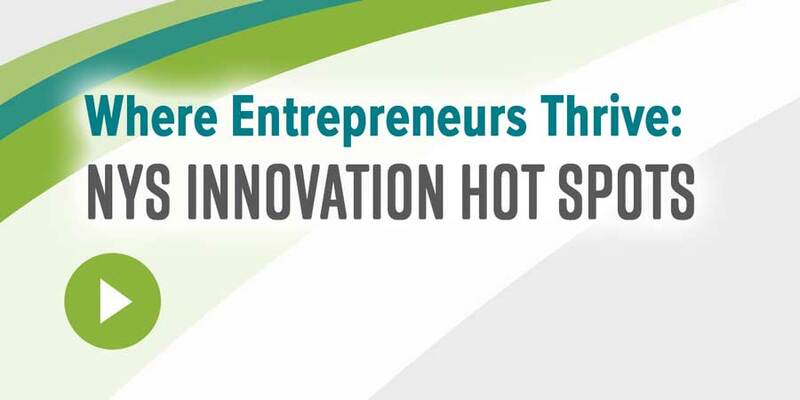 Innovation Hot Spots coordinate regional entrepreneurial ecosystems to support startups and early-stage companies. They provide access to capital, mentoring, physical workspaces, networking opportunities, and technical services, and can offer tax benefits to client businesses. The Western New York Incubator Network (WIN), based at the University at Buffalo, is a collaborative effort of business incubators that has provided direct assistance to more than 70 startups during its first four years. This was accomplished by connecting young companies to UB’s many resources including student talent, faculty expertise, entrepreneurial support programs and world-class facilities.